Indicate by check mark whether the registrant is a large accelerated filer, an accelerated filer, a non-accelerated filer, or a smaller reporting company. See the definitions of "large accelerated filer," "accelerated filer" and "smaller reporting company" in Rule 12b-2 if the Exchange Act. As of January 10, 2016, there were 80,399,187 shares of the registrant's common stock outstanding. Market Price for the Registrant's Common Equity, Related Stockholders Matters and Issuer Purchases of Equity Securities. We are considered an "exploration stage" company under the U.S. Securities and Exchange Commission ("SEC") Industry Guide 7, Description of Property by Issuers Engaged or to be Engaged in Significant Mining Operations ("Industry Guide 7"), because we do not have reserves as defined under Industry Guide 7. Reserves are defined in Guide 7 as that part of a mineral deposit which can be economically and legally extracted or produced at the time of the reserve determination. The establishment of reserves under Guide 7 requires, among other things, certain spacing of exploratory drill holes to establish the required continuity of mineralization and the completion of a detailed cost or feasibility study. Because we have no reserves as defined in Industry Guide 7, we have not exited the exploration stage and continue to report our financial information as an exploration stage entity as required under Generally Accepted Accounting Principles ("GAAP"). Although for purposes of FASB Accounting Standards Codification Topic 915, Development Stage Entities, we have exited the development stage and no longer report inception to date results of operations, cash flows and other financial information, we will remain an exploration stage company under Industry Guide 7 until such time as we demonstrate reserves in accordance with the criteria in Industry Guide 7. Because we have no reserves, we have and will continue to expense all mine construction costs, even though these expenditures are expected to have a future economic benefit in excess of one year. We also expense our reclamation and remediation costs at the time the obligation is incurred. Companies that have reserves and have exited the exploration stage typically capitalize these costs, and subsequently amortize them on a units-of-production basis as reserves are mined, with the resulting depletion charge allocated to inventory, and then to cost of sales as the inventory is sold. As a result of these and other differences, our financial statements will not be comparable to the financial statements of mining companies that have established reserves and have exited the exploration stage. This Annual Report on Form 10-K contains forward-looking information. Forward-looking information includes statements relating to future actions, prospective products, future performance or results of current or anticipated products, sales and marketing efforts, costs and expenses, interest rates, outcome of contingencies, financial condition, results of operations, liquidity, business strategies, cost savings, objectives of management of Kibush Capital Corporation (hereinafter referred to as the "Company," "Kibush Capital," or "we") and other matters. Forward-looking information may be included in this Annual Report on Form 10-K or may be incorporated by reference from other documents filed with the Securities and Exchange Commission (the "SEC") by the Company. One can find many of these statements by looking for words including, for example, "believes," "expects," "anticipates," "estimates" or similar expressions in this Annual Report on Form 10-K or in documents incorporated by reference in this Annual Report on Form 10-K. The Company undertakes no obligation to publicly update or revise any forward-looking statements, whether as a result of new information or future events. The Company has based the forward-looking statements relating to the Company's operations on management's current expectations, estimates and projections about the Company and the industry in which it operates. These statements are not guarantees of future performance and involve risks, uncertainties and assumptions that we cannot predict. In particular, we have based many of these forward-looking statements on assumptions about future events that may prove to be inaccurate. Accordingly, the Company's actual results may differ materially from those contemplated by these forward-looking statements. Any differences could result from a variety of factors, including, but not limited to general economic and business conditions, competition, and other factors. Kibush Capital Corporation ("we", "us", "our", the "Company" or the "Registrant") is a mineral and natural resources exploration company. We are currently undertaking mineral exploration activities in Australia and Papua New Guinea. Our business is comprised two subsidiaries Aqua Mining and Angel Jade. Our Aqua Mining subsidiary is active in mineral exploration in Papua New Guinea where we are exploring for gold. Our Angel Jade subsidiary is active in mineral exploration in New South Wales, Australia where we are exploring for jade. In addition, on June 12, 2015, the Company has taken over management of Paradise Gardens (PNG) Ltd., a timber logging and processing company in Papua New Guinea. We are an exploration stage company as defined by the Security and Exchange Commission's ("SEC") Industry Guide 7 as the Company has no established reserves as required under the Industry Guide 7. We were incorporated in the State of Nevada on January 5, 2005 under the name Premier Platform Holding Company, Inc. The Company changed its name to Paolo Nevada Enterprises, Inc. on February 4, 2005. On August 18, 2006, the Company completed a merger with Premier Platform Holding Company, Inc., a Colorado corporation, where Paolo Nevada Enterprises, Inc. was the surviving entity. On November 1, 2006, the Company changed its name to the David Loren Corporation. On July 5, 2013, More Superannuation Fund, an Australian entity ("More"), obtained control of the Company from Beachwood Capital, LLC, a Nevada limited liability company. On August 23, 2013, the Company changed its name to Kibush Capital Corporation. On October 15, 2013, the Company completed the acquisition of 80% of the common stock of Instacash Pty Ltd., a micro-lender licensed in Australia ("Instacash"). For the fiscal year ended September 30, 2014, Instacash had no revenues, $396,493 in assets and $429,270 in liabilities. In order to focus solely on its mining investments, the Company disposed of Instacash during the quarter ended March 31, 2015. On March 23, 2015, the Company increased its ownership in Aqua Mining Limited, a Papua New Guinea limited company ("Aqua Mining") from 49% to 90% in exchange for assignment of the Company's entire interest in the Koranga Joint Venture to Aqua Mining. Due to the increase in ownership and due to the fact that the additional interest in Aqua Mining was acquired from a related party we changed the ament accounting treatment for this asset and are now consolidating its financials with our own. For the fiscal year ended September 30, 2014, Aqua Mining had no revenues, $18,565 in assets and $91,872 in liabilities. For the interim period ended March 31, 2015, Aqua Mining had no revenues, $46,755 in assets and $215,003 in liabilities. The Company acquired control of Angel Jade Pty Ltd., an Australian limited company ("Angel Jade") through a series of transactions as follows: In October 2014, the Company negotiated the acquisition of a 50% interest in Angel Jade (which was 90,000,000 shares of common stock) from Five Arrows Limited in exchange for 14,000,000 shares of our common stock. However, this agreement was not formalized until December 10, 2014. On October 9, 2014, the Company acquired 3,673,470 shares of newly issued common stock of Angel Jade in exchange for $17,170 ($19,584 AUD). These two transactions combined were intended to provided Kibush Capital with exactly 51% of the common stock of Angel Jade and control of the that company. On November 6, 2014, the Company further increased its ownership of Angel Jade by purchasing an additional 45,918,300 shares of common stock directly from Angel Jade for $215,994 ($250,000 AUD) and by purchasing 18,367,350 share of common stock from Laima Trust for $86,398 ($100,000 AUD). Several minority shareholders have disputed the issuance of additional shares to the Company. See Item 3 for more detail. We now own approximately 69% share of the issued and outstanding shares of Angel Jade's common stock which totals 229,591,770 shares. For the fiscal year ended September 30, 2014, Angel Jade had no revenues, $13,906 in assets and no liabilities. For the interim period ended March 31, 2015, Angel Jade had no revenues, $179,075 in assets and $397 in liabilities. Angel Jade's financials are consolidated with our own financials in this report. The Company is an "emerging growth company" as defined in the Jumpstart Our Business Startups Act ("JOBS Act"). Our auditors have issued a going concern opinion. This means that our auditors believe there is substantial doubt that we can continue as an on-going business for the next twelve months unless we obtain additional capital to pay our bills. This is because we have not generated any significant revenues from our current business. In addition, we have sustained losses for the past two years and have a negative working capital at September 30, 2015. We must raise cash from sources other than operations. Our only other source for cash at this time is investments by others in our company. We must raise cash to continue our mining exploration activities and business development. Our business is comprised of mining exploration activities through our subsidiaries Aqua Mining and Angel Jade. Our primary office is located at 7 Sarah Crescent, Templestowe, Victoria 3106, Australia. The company is an exploration stage company and there is no assurance that a commercially viable mineral deposit exists on any of our properties. Further exploration will be required before a final evaluation as to the economic and legal feasibility is determined. On February 14, 2014, we entered into an Assignment and Bill of Sale with Five Arrows Limited ("Five Arrows") pursuant to which Five Arrows agreed to assign to the Company all of its right, title and interest in two 50 ton per hour trammels, one 35 ton excavator, a warehouse/office, a concrete processing apron and four 35 ton per hour particle concentrators which may be utilized for alluvial mining, the assignment also conveyed Five Arrow's interest in a joint venture with the holders of mining leases ("Leaseholders") for gold exploration in Papua New Guinea, specifically Mining Leases ML296-301 and ML278 covering approximately 26 hectares located at Koranga in Wau, Morobe Province, Papua, New Guinea (the "Koranga Property"). In consideration therefor, the Company issued 40,000,000 shares of its common stock to Five Arrows. On February 28, 2014, we entered into a joint venture agreement with the Leaseholders (the "Joint Venture Agreement") for the exploration of minerals on the Koranga Property. The Joint Venture Agreement entitles the leaseholders to 30% and the Company to 70% of net profits from the joint venture. 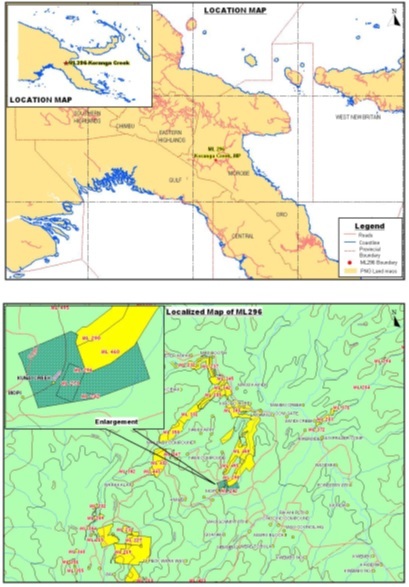 On May 23rd 2015 this Joint Venture was sold to our subsidiary Aqua Mining (PNG) Ltd. Aqua Mining will manage and carry out the exploration at the site, including entering into contracts with third parties and subcontractors (giving priority to the Leaseholders and their relatives and the local community for employment opportunities and spin-off business) at its cost, and all assets, including equipment and structures built on the site, will be the property of the Company. The Leaseholders and Aqua Mining will each contribute 1% from their share of net profits to a trust account for landowner and government requirements. For the period ending September 30,2014 we have incurred expenditure of $208,512 primarily spent on exploration. From October through to December there has been an expenditure of $56,526 on capital equipment and further exploration costs. The joint venture involves a lease that, between 2008 and 2011, has produced a total of 55,300 cubic meters of mined material which was processed to extract 51,000 grams of gold - raw weight (approximately 31kg pure gold) over the three years of mining activities. Gold production in 2010 averaged 1.97kg per month and in 2011 averaged 2.26kg per month. The overall raw gold grade is 0.92g per cubic meter. Pure gold grade is 0.55g per cubic meter. The Company is currently in the exploration stage for this lease. If and when successful, the Company may endeavor to undertake additional joint ventures on neighboring leaseholds (8 leaseholds border the area) to capitalize on the infrastructure and equipment we may install at Koranga. We entered into a memorandum of understanding, dated May 1, 2014 with New Guinea Gold Corporation, for the purchase of New Guinea Gold Ltd., which was terminated by us on May 24, 2014 prior to commencing any transactions contemplated in connection therewith. The Company has no continuing obligations as a result of such termination. Aqua Mining is currently in the exploration stage. Aqua Mining was created to undertake certain opportunities that exist within the mining sector of the economy of Papua New Guinea. The Director Mr. Vincent Appo, has extensive experience and knowledge in this sector and has over the years assembled a vast network of contacts and contractors that will assist the company in their managerial and operational endeavors. From the outset the company is negotiating over 2 mine sites for further exploration. Aqua Mining in the past six months has negotiated and finalized with landowners in the WAU area of PNG, Joint Ventures to conduct mineral exploration activities. These Joint Venture Agreements will form the basis of applications to the Mining Resource Authority in PNG for Mining Licenses. In addition, Aqua Mining has been accepted as a developer of AML 694-695. On or about April 8, 2015, the Company commenced exploration of the Alluvial Mining Lease 694/695 via its Subsidiary Aqua Mining PNG Limited. Mr. Vincent Appo, PNG Operations Manager, is overseeing the construction of the required infrastructure which is required for the Company's exploration activities. On or about April 16, 2015, the Company announced commencement of a Jorc/43-101 report on the Mining Lease 694/695 and pending Mining Lease 296/301 held by its subsidiary, Aqua Mining PNG Limited. Ken Unamba, a member of the Advisory Committee has been nominated to oversee this report. Vincent Appo, PNG Operations Manager, has undertaken substantial testing over the past 12 months on both areas and has enough data as a basis for assessment and review. Mr. Unamba will undertake additional surveys and sampling where necessary to provide further data to finalize the report to Kibush Capital. The Company owns 70% of the ordinary shares of Angel Jade Pty Ltd, an Australian company. The assets of Angel Jade are comprised of Exploration License 8104, the area covered is 35 km SE of Tamworth, 300 sq. km in size, 250 km from the port of Newcastle, NSW and accessible by sealed road. Nephrite jade occurs in the New England Fold Belt, which extends from northeast New South Wales into southeast Queensland. The target mineral in this tenement is jade, but we will also explore for rhodonite. Angel Jade has identified a 3 tiered exploitation of jade. The First Tier, finely ground lower quality jade to nano particle sized powder, enabling the jade to release infra-red radiation. These particles can be added to paint, ceramic tiles and to cotton for use in fabrics. The Second Tier, exclusive works of art created by the renowned artist Xie Shen. These carved pieces are typically between 0.5 and 2 tons each, and would be showcased at major Asian Art Galleries. The Third Tier is to establish a premium high end Jade Brand for jewelry and art, to be sold and marketed through respected gallery and jewelry outlets. The current price of jade per kilogram has a spread of $5 to $50 depending on the grade. Kibush Capital Corporation had entered into a management agreement with Paradise Gardens Development (PNG) Ltd, a Timber Logging and Processing Company with operations in Papua New Guinea ("Paradise Gardens"). The Company has the right to Paradise Gardens operates a Timber Authority registered with the PNG Forest Authority which permits an annual timber harvest of 5000 cubic meters, the total area under the Timber Authority is 3300 hectares. Predominant species include Terminalia, Aglaia, White Cheesewood, Pink Satinwood, Erima, Taun, Rosewood, Kwila and other hardwoods. Paradise Gardens primarily sells its timber locally to retailers and wholesalers in Papua New Guinea. The Company is in negotiations with the owner of Paradise Gardens to acquire control of Paradise Gardens. During the negotiation period, the Company's management fee includes the profit earned by Paradise Gardens during such period. Nephrite jade is not a common mineral and occurs in nature very rarely and usually in remote locations, hence its prized status and value. It is currently mined in New Zealand, Pakistan, Canada, Russia and Australia. Climatic concerns limit the amount of mining that can be done in Canada and Russia and political extremism is a threat in Pakistan. New Zealand nephrite whilst generally high grade only occurs under the southern alps and glaciers and is usually only of the green variety and found in isolated small pods in small quantities. In Australia, nephrite occurs in South Australia near Cowell, in Western Australia near Ninghan in the Murchison region outside of Perth and in New South Wales at the Angel Jade tenements near Tamworth. The Cowell and Ninghan nephrite deposits consist of 'black' nephrite mainly and are generally lower grade with small quantities of high-grade commercial saleable material. The Angel Jade Tamworth occurrences are extensive, ranging along the great NS serpentinite belt of NSW that runs for over 200kms. The nephrite found there ranges in quality and varietal characteristics from classic imperial green, through to blue, black and the much prized 'mutton fat' coloration. Angel Jade is better placed than its competitors to be able to successfully continually supply quality and quantity of material to its selected markets. The primary product is Gold and our market price based on the London Metals Exchange Daily Rate. This rate determines a market price for all material sold within the Refinery Market. Outside of that market competition dictates the price available, and that competition has effectively no difference in the quality of the material as it based on a gold percentage. A higher price can be obtained by selling to the spot traders who can distribute the material at lower volumes to industry consumers. A four pronged distribution approach for our nephrite (jade) has been developed that target: wholesale building suppliers through industry groups and trade shows, wholesale jewelry suppliers in China and SE Asia, direct marketing to the high end art market in China and the Middle East via brokers and producing material suitable for high tech industrial usage such as substrates and insulators through an industry based online campaign targeting research universities, R&D facilities and allied scientific suppliers. As the principal material is gold, the options are to sell either to a refinery and be paid the daily spot rate, or to sell to the jewelry wholesale market. Both of these options exist internally within PNG however the wholesale market is quite small. There are several options when the material is exported from PNG, again it could be to any refinery within the region and that rate again would be the daily spot rate. The wholesale market outside the country would be significant and there are many opportunities within Australia to sell at a higher than spot rate to that market. There may also be parties that would take up the material on a contractual basis. The mining industry is acutely competitive in all of its phases. We face strong competition from other mining companies in connection with the acquisition of exploration stage properties or properties containing gold, jade and other mineral reserves. Many of these companies have greater financial resources, operational experience and technical capabilities than us. It is our goal to find under valued properties and team up with local joint venture partners to streamline our time to market and costs. In PNG in particular we are finding a number of such properties, as the enforcement of the Mining Act has forced traditional landowners to comply with the relevant requirements of the act. Their ability to do so is limited as they do not have the financial, or management resources to comply. We are not dependent on any principal suppliers and our raw materials are produced principally through our own mining activities. Our principal customers for our mining activities are wholesale markers in China, SE Asia and the Middle East. A customer base is yet to be established but that will occur over the next 12 months. We are not dependent on any principal suppliers and our raw materials are produced principally through our own mining activities. Our principal customers for our mining activities are Refineries based in PNG. A wholesale customer base is yet to be established but that will occur over the next 12 months, after the company received the appropriate export licenses from the PNG government. Intellectual property is not a large part of our current business model as we are selling non-unique materials through primarily conventional channels. One or more brands may yet be developed if we determine branding will benefit the Company. Our products and services are subject to foreign, federal, state, provincial and local laws and regulations concerning business activities in general, including the laws of Papua New Guinea and Australia. Our operations will be affected from time to time in varying degrees by domestic and foreign political developments, foreign, federal and state laws. The mining industry in Australia is governed by Federal Government law but administered by the States. Angel Jade tenements are administered and regulated by the NSW Department of Trade and Industry (DTI). Its principal field office for the mining sector is located in Maitland, approximately 250 kilometers from Tamworth. To maintain the company's tenements in good order and standing with the DTI, an Annual Report must be lodged every year detailing all works to date and monies expended toward same. An environmental bond is also held by the DTI to ensure compliance and remediation on vacation of the tenement. Angel Jade currently holds an Exploration License, EL8104, which requires renewal every two years. Current date of renewal is June 30, 2015. Renewal is usually only withheld where there have been serious compliance issues. During the course of the exploration program, the company may elect to apply for one or more mining leases within the boundaries of its EL. This would be subject to satisfactory interpretation of geological data suggesting a commercial mining would be viable and could be established with some certainty. As the 90% owner of Aqua Mining [PNG] Limited, a Papua, New Guinea company, we are required to obtain approval from the Investment Promotion Authority of Papua New Guinea to be recognized as a foreign investor for our mineral exploration joint venture with the Leaseholders of approximately 26 hectares located at Koranga in Wau, Morobe Province, Papua, New Guinea. On July 24, 2015, we received final approval from the Papua New Guinea Department of Environment and Conservation, the Papua New Guinea Mining Resources Authority and the Mining Advisory Committee. This approval allows for mechanized processing on on land controlled by the Koranga Joint Venture for a period of 20 years and Aqua Mining is the licensed contract miner for a period of 5 years. This AML license is limited to 50,000 tones of processing per year and to a maximum of 5-hectares of mining at any one time. We must report our exploration activities and sales monthly to the Mining Resource Authority and comply with the terms of the agreements with the landowners. The tribute agreement for this land requires contribution of 2% of gross sales over 3 grams of ton and 2% of gross sales when under 5 grams per ton. Environmental issues and compliance are administered by the NSW EPA. The proposed mining activity and processing by Angel Jade will not involve the use of any chemicals, hence the key areas of concern to the EPA will be in the areas of soil erosion, flora and fauna, water monitoring and effective remediation. The EPA can issue non compliance notices that in the case of serious breaches may jeopardize the tenement's standing. However, this is considered a low risk for this style of mining where no chemicals are utilized and the mining activity is near surface. Under our Alluvial Mining Lease, we must comply with the provisions of the Mining Act pertaining to Environmental requirements. We are subject to applicable environmental legislation including specific site conditions attached to the mining tenements imposed by the PNG Government Department of Environment and Conservation ("DEC"), the terms and conditions of operating licenses issued by the PNG Mineral Resources Authority ("MRA") and DEC, and the environment permits for water extraction and waste discharge issued by DEC. In the fourth quarter of fiscal 2014, the PNG Parliament approved a name change for the Department of Environment and Conservation to the Conservation Environment Protection Authority and that change has become effective. As of January 10, 2015, the Company has 42 full time employees. The Company does not lease any properties or facilities. We own a building consisting of 1,200 square feet of office and warehouse space on property owned by James Koitamara, a member of the Kornaga Joint Venture, located on mining lease ML297 in New Guinea. The building and other personal property was assigned to us by Five Arrows pursuant to the Assignment Agreement attached as Exhibit 10.5. The Company utilizes office space from its corporate counsel for a nominal quarterly fee, this space is physically located at 5635 N. Scottsdale Road, Suite 170, Scottsdale, AZ 85250. Management has determined that this arrangement is adequate for its current and immediate foreseeable operating needs. The Company does not own or lease any of the mining properties directly and we have no right to acquire a lease or license for the Koranga properties. Rather titles are held by the landowners who were given the properties covered by the mining leases by the Papua, New Guinea government from 1966 to 1968. The Company has the right to manage and finance the exploration of each mining license pursuant to a Joint Venture Agreement with each of the landowners. As part of that agreement, the Company is entitled to 70% of the net profits from mineral exploration and any production. The mining licenses included in the Koranga Joint Venture are: ML296, ML297, ML298, ML299, ML300 and ML301. Our conversion application for Mining Lease Nos. ML 296 through ML 301 was approved on July 24, 2015. The permit requires payment of K6440.96 (approximately $2,329 U.S. Dollars) within 30 days. This fee is comprised of a Security Deposit, a Tribute Agreement Fee, and rent through July 23, 2015. Furthermore, the permit holder must carry out works associated with the mining activity in accordance with the plans and specifications in the environment permit. Such requirements include nominal monetary payments, development of an environmental management plan, a waste management plan, water extraction plan, monitoring and reporting. 1. An average of 75 cubic meters of materials was processed per shift. However, records from Koranga Westland Ltd. show that without breakdowns, 130-50 cubic meters could be processed in a shift period. 2. The gold grade of the material ranges between 0.1g and 5 grams per cubic meter and averages around 0.6grams per cubic meter. Raw weight is around 0.92grams per cubic meter. 3. Fineness of the alluvial gold from the lease area is between 58% and 65%, and at times higher. 4. A total of 55,300 cubic meters of mined material was processed to extract 51,000 grams of gold - raw weight (approximately 31kg pure gold) over the two years of mining activities, during the period from 2008 to 2011. 5. The mined material is comprised both of conglomerates and interbedded conglomerate, siltstone, sandstone and mudstones. 6. The mined material was rare to weakly lithified, free digging, poorly consolidated with rock clasts dislodging easily. 7. Only sluice boxes were used to capture the concentrates. The recovery was 80% during the period from 2008 to 2011. Koranga Westland Ltd. ceased production in 2011 due to capital constraints. The Company does not plan to undertake any exploration and/or development of the property. The property is split by the Koranga creek with sedimentary deposits running through the creek and side walls with visible gold strata's. The exploration activities will be alluvial mining and to that nature will be open pit. The present condition of the property is an open area with a river running through the center of the mining leases. The equipment used is new, the modernization is basic as the type of mining at this stage is sluice boxes and pressure hoses. The current mining lease only allows for non-mechanized processing. The current cost of equipment is approximately $150,000 and if and when we move to mechanized processing, we estimate the cost of equipment to be in excess of $1,000,000. There has been no annual production of minerals to report for the Koranga Joint Venture properties for fiscal years 2015 and 2014. The tectonic feature that hosts the project site and may have been influential in creating an environment conducive for the alluvial gold deposit is the Bulolo graben. It is bounded on the East and West by sub parallel Northwest trending transfer structures while bounded by Northeast trending transfer structures on the North and South. The Northwest trending structures and the subsidiary fractures have accommodated much of the mineralization and have controlled a series of intrusions. The basement rock of the area is metamorphics, intruded by Miocene granodiorite, and believed to be the source of high fineness gold mineralization in the area. A serious of other intrusions occurred, giving rise to further mineralization which is believed to have contributed to much of the prospects in the project area. These intrusions where associated with volcanism that resulted in blocking off of the Bulolo River and consequently the formation of the gold bearing sequence. The Otibanda Formation is the target alluvial gold bearing sedimentary sequence. It is a lacustrine sequence that was deposited in a fresh water lake. Mapping shows the apparent thickness of the sequence to be 700m and is alluvial gold bearing. The sequence is comprised of interbedded agglomerates, sandstones, siltstones and intercalated thin mudstone. The deposit is the result of an eruptive volcanism that blocked off the Bulolo River resulting in blockage and setting up of a fresh water lake. All sediments including gold shedding off from the surrounding hills and mountains were deposited into the lake. The enriched sequence is the source of gold for the miners down creek and our target in this project. Proven or probable reserves have not been established. The Koranga property has been physically inspected by Ken Unamba, a professional geologist, but a formal feasibility study for the property has not been prepared. Furthermore, there are no current detailed plans to conduct exploration on the property, nor are any phased programs planned. Exploration work will be performed and/or supervised by Mr. Ken Unamba, a geologist and member of our advisory committee. Mr. Unamba has a Science Degree majoring in Geology. His 22 years' work experience covers Exploration Geologist for Tolukuma Gold Mine Ltd., Consulting Geologist for Harmony Gold SE Asia and Filmena Resources Corp Philippines. He was appointed to the then Mining Advisory Board in 2000 for five years as Technical Advisor. Our exploration budget for Aqua Mining is $200,000, including geophysics, sampling and exploration labor. At this time, we are uncertain how our exploration work will be funded. 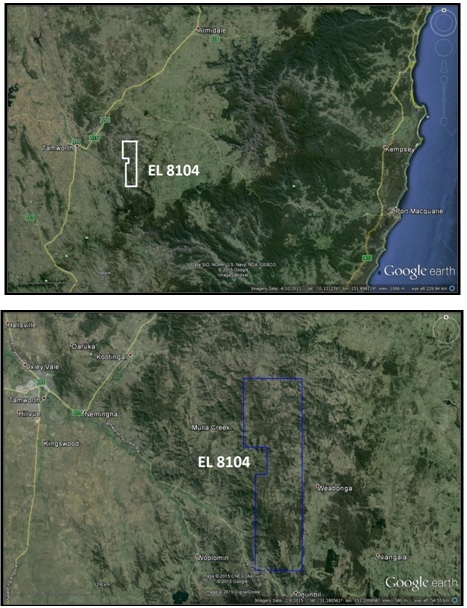 EL 8104 is situated approximately 35 kilometres south-east of the major regional centre of Tamworth, in north-eastern New South Wales. The EL covers about 100 square kilometres and was granted for Group 2 and Group 3 mineral exploration for a two-year renewable term. This EL (8104) supersedes Angel Jade's previous EL (7883) which covered the same area but without extensions to the north and east. EL8104 is believed to contain nephrite jade and other minerals. Proven or probable reserves have not been established. The license for EL8104 is issued by the New South Wales State Government. This license permits us to take up to 70 tons of material for evaluation and testing annually. In order to maintain our license, the Company must undertake exploration activities of at least AUS $150,000 per year. We are currently in the renewal period as our renewal application was submitted June 10, 2015. If approved, the renewal term would run through June 15, 2017. While we have no reason to believe the renewal application will be denied, if our renewal is not approved, our license would immediately terminate. Access to the license area is obtained along a sealed road connecting Tamworth with Port Macquarie. The road runs south-east from Dungowan to Ogunbil and passes through the south-west corner of the licence area, following Dungowan Creek. The main access to EL8104 is via a dirt road which turns off this road about 10.5 kilometres south-east of Dungowan and follows Spring Creek and Teatree Gully, to Mulla Creek, through the centre of the EL. There are a number of habitations and other buildings along Dungowan Creek, but most of the licence area is fairly hilly and forested, with no buildings. Cattle are pastured in the Dungowan Creek area and to a lesser extent in the west and north of the licence. This EL was applied for to cover a serpentinite belt which is known to host several nephrite jade occurrences. This serpentinite trends slightly east of north and is probably a splay from the major north-north-west trending Peel Fault serpentinite belt to the west. Jade was apparently first found here in about 1962 (MacNevin & Holmes, 1980) but was not officially documented or petrologically identified until 1964 (Smith, 1964). Angel Jade applied for and was granted 59 units in addition to the original EL in June 2013. In October of 2013, access was arranged with three of the landholders whose properties contain the area of old workings and most potential for further discoveries. The company has been unable to explore significant portions of the EL because access agreements have not yet been established with all of the landowners. The Company has spent money and resources negotiating access agreements with many of the landholders and is making progress with many of the owners. However, there are some landowners who are holding out and may force the Company to take legal action to secure its right to access the property for mineral exploration. There has been no annual production of minerals to report for Angel Jade for fiscal years 2015 and 2014. The nephrite jade occurs in the New England Fold Belt, which extends from northeast New South Wales into southeast Queensland. The jade occurrence is within the central block of the fold belt, a few kilometres east of the Peel Fault, a major structure which runs slightly west of north in the project area location. The "country rock" in the jade region is predominantly metamorphosed (sub-green schist facies) fine grained sediments, plus chemical sediments (chert, jasper) and some meta-volcanics (mostly basaltic and/or andesitic). These are part of the Woolomin Group and the stratigraphy is steeply dipping and trends roughly north-south. EL 8104 covers a smaller serpentinite belt which is known to host several nephrite jade occurrences. The jade-bearing serpentinite belt was evidently not properly recognised when the jade was first found and mined and is not shown on the 1:250,000 Tamworth geological map sheet, first published by the Geological Survey of New South Wales in 1971, about nine years after the first jade discovery in the project area. It is, however, shown in the 1:250,000 digital dataset now available and the fault-bounded serpentinite bodies from this dataset are shown within that dataset. There are three smaller bodies to the south and one larger elongate body to the north. Copper is probably the main economic mineral in the area, with a number of small to medium sized deposits occurring, usually in association with the serpentinites and/or (possibly) meta-volcanics within the country rock. No copper has been recorded in the serpentinites hosting the jade occurrences. There are also numerous rhodonite occurrences of varying sizes within a north-south zone extending about 20 kilometres east of the Peel Fault. These are typically lenses in the country rock, associated with stratiform manganese oxide bodies. There is a small historic gold-field about 5 kilometres east of EL 8104, at Weabonga. The gold is in small quartz veins and recorded production was about 7,000 ounces (Mumbil Mines NL, 1989). This area is currently covered by EL 6620, Icon Resources Ltd. The Tamworth nephrite jade has been documented as occurring in lens-shaped bodies (locally referred to as "seams") on the faulted contact of the serpentinite and country rock. The country rock is mostly comprised of low-grade metamorphosed shale, siltstone, and silty sandstone. The compact, fine-grained nephrite is inferred to have formed under pressure in this contact zone. Hockley et al, 1978, identifies a zonation from massive serpentinite, to schistose serpentinite, to talc, to nephrite, to "country rock" (quartz phyllite). This is probably based on one of the two sites apparently visited by Hockley, however and may be a gross simplification, which may not generally apply. The serpentinite is probably commonly schistose close to the faulted margin/contact with the country rock, as might be expected in such a deformational zone but the nephrite and talc will not always be present (one or both may be missing) and the "talc" may actually (often) be more a massive fine grained serpentine mineral. Serpentine is a secondary mineral produced by the hydrothermal alteration of magnesium silicate minerals. The distinction needs to be made between serpentine, the mineral and serpentinite, the rock. Serpentine mineral is typically massive, fine grained, moderately soft (hardness 2 to 5), may have a slightly greasy feel and is commonly greenish in colour. Differentiation between serpentine and nephrite in hand specimen may be difficult, except by identifying the greater hardness of the nephrite. At the Tamworth jade project, much of the material dismissed as "talc" may actually be a serpentine, as may some of the rock initially identified as "jade". There are a number of varieties of serpentine minerals recognised and some may be of value in their own right (though less so than nephrite) for carving or ornamental purposes. "Bowenite", which apparently occurs within EL 8104, is a variety of antigorite serpentine. 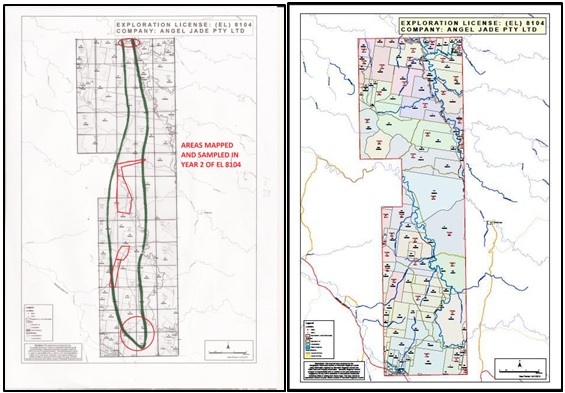 The Angel Jade property has been physically inspected by Matthew Stephens, a professional geologist, but a formal feasibility study for the property has not been prepared. Furthermore, there are no current detailed plans to conduct exploration on the property, nor are any phased programs planned. Exploration work will be performed and/or supervised by Matthew Stephens. Mr. Stephens has had over 25 years of continuous experience in the Mining Industry, having worked in Metalliferous Mining, Development, Resource Evaluation and Exploration. Matthew has been involved in the active (i.e. "hands on") exploration of a variety of commodities including Gold, Base Metals, Iron and Uranium as well as having detailed exposure with the development and mining of nine underground mines and nine open pit operations throughout Queensland, Western Australia, New South Wales and the Northern Territory. Matthew holds a BAppSc (Geology) and is a member if the AusIMM (MAusIMM). We are not presently a party to any litigation. However, the minority shareholders in Angel Jade are challenging the basis of funding by Kibush Capital that resulted in the share issuances that gave Kibush Capital a controlling interest in Angel Jade. Our Australian legal representatives have expressed the opinion that the Angel Jade Board did unanimously resolve and pass the share issuances in question. Kibush Capital will vigorously contest any challenge to the share issuance. ITEM 5. MARKET PRICE FOR THE REGISTRANT'S COMMON EQUITY, RELATED STOCKHOLDER MATTERS AND ISSUER PURCHASES OF EQUITY SECURITIES. Our shares of common stock are traded on the OTC Pink operated by the Financial Industry Regulatory Authority (FINRA) under the symbol "DLCR". The shares trading of our common stock began on August 1, 2013. As of January 10, 2016, we had 202 stockholders of record. We have never declared or paid cash dividends. There are currently no restrictions which limit our ability to pay dividends in the future. On January 8, 2016 the closing bid price of our common stock on the OTC pink sheets quotation system was $0.0175 per share. As of January 10, 2016 there were 202 holders of record of our common stock. We have not declared or paid any cash dividends on our common stock and we do not anticipate paying any dividends in the foreseeable future. We expect to retain any future earnings to finance our business activities and any potential expansion. The payment of cash dividends in the future will depend upon our future revenues, earnings and capital requirements and other factors the Board considers relevant. The Company does not have any warrants outstanding and the Company has not yet adopted a stock option plan. On April 29, 2015, the Company issued 3,001,702 shares of its common stock to Warren Sheppard (previously authorized by for issuance by the company on December 10, 2014) pursuant to his employment agreement. Between April 1, 2015 and June 24, 2015, the Company issued a total of 4,000,000 shares of common stock upon the requests from convertible note holders to convert principal totaling $4,000 into the Company's common stock based on the terms set forth in the loans. The conversion rate was $0.001. On February 4, 2015, the Company issued 2,000,000 shares of common stock to Cavanagh pursuant to conversion of a portion of the Convertible Promissory Note dated May 1, 2012. On April 5, 2015, the Company issued 2,000,000 shares of common stock to Cavanagh pursuant to conversion of a portion of the Convertible Promissory Note dated May 1, 2012. On or about April 24, 2015, the Company issued 14,000,000 shares of common stock to Five Arrows for the Angel Jade acquisition pursuant to that Agreement dated December 10, 2014. Each of the foregoing issuances was exempt from the registration requirements of the Securities Act of 1933, as amended pursuant to Section 4(2). As of January 10, 2016, there are 80,399,187 shares of the Company's common stock issued and outstanding. We have no equity compensation plans at the present time. Our company's shares are covered by Section 15(g) of the Securities Exchange Act of 1934, as amended that imposes additional sales practice requirements on broker/dealers who sell such securities to persons other than established customers and accredited investors (generally institutions with assets in excess of $5,000,000 or individuals with net worth in excess of $1,000,000 or annual income exceeding $200,000 or $300,000 jointly with their spouses). For transactions covered by the Rule, the broker/dealer must make a special suitability determination for the purchase and have received the purchaser's written agreement to the transaction prior to the sale. Consequently, the Rule may affect the ability of broker/dealers to sell our securities and also may affect your ability to sell your shares in the secondary market. Section 15(g) also imposes additional sales practice requirements on broker/dealers who sell penny securities. These rules require a one page summary of certain essential items. The items include the risk of investing in penny stocks in both public offerings and secondary marketing; terms important to in understanding of the function of the penny stock market, such as "bid" and "offer" quotes, a dealers "spread" and broker/dealer compensation; the broker/dealer compensation, the broker/dealers duties to its customers, including the disclosures required by any other penny stock disclosure rules; the customers rights and remedies in causes of fraud in penny stock transactions; and, the FINRA's toll free telephone number and the central number of the North American Administrators Association, for information on the disciplinary history of broker/dealers and their associated persons. The application of the penny stock rules may affect your ability to resell your shares. Until 2013 we were engaged in the design, production and wholesale merchandising of quality women's and men's apparel, and home furnishings. Since then our business activities are conducted through our wholly-owned subsidiaries. Our business consists of a jade exploration venture in Australia and an gold exploration venture in Papua, New Guinea. We will remain an "emerging growth company" for up to five years, or until the earliest of (i) the last day of the first fiscal year in which our total annual gross revenues exceed $1 billion, (ii) the date that we become a "large accelerated filer" as defined in Rule 12b-2 under the Securities Exchange Act of 1934, which would occur if the market value of our ordinary shares that is held by non-affiliates exceeds $700 million as of the last business day of our most recently completed second fiscal quarter or (iii) the date on which we have issued more than $1 billion in non-convertible debt during the preceding three year period. The following discussion of the financial condition and results of our operations should be read in conjunction with the financial statements and the related notes thereto included elsewhere in this Annual Report on Form 10-K for the year ended September 30, 2015 (this "Report"). This report contains certain forward-looking statements and our future operating results could differ materially from those discussed herein. Certain statements including, without limitation, statements containing the words "believes", "anticipates," "expects" and the like, constitute "forward-looking statements". Such forward-looking statements involve known and unknown risks, uncertainties and other factors which may cause our actual results, performance or achievements to be materially different from any future results, performance or achievements expressed or implied by such forward-looking statements. Given these uncertainties, readers are cautioned not to place undue reliance on such forward-looking statements. We disclaim any obligation to update any such factors or to announce publicly the results of any revisions of the forward-looking statements contained or incorporated by reference herein to reflect future events or developments. The Company's current strategy is to engage in mining activities. We are currently focused on building its management team. The Company hopes to undertake a number of additional mining projects so the cost of the team could be amortized over a number of cost centers. We believe that this team would enable the Company to consider exploration in various geographical locations in addition to Papua New Guinea. For example, there are a number of projects that we have identified that would flow from our involvement in our mining joint venture in Papua New Guinea. Under the terms of our joint venture we are able to supply food, clothing, housing and medical supplies which we would hope to be able to service not only our requirements in the region but to expand and supply other markets within that region. We believe that there may be other opportunities that would evolve from our presence in Papua, New Guinea if we have an infrastructure to capitalize on those opportunities. We currently believe that we will need $2,000,000 over the next 12 months to develop plans for our business. In addition to the dispute described in Item 3, we have recently experienced a few setbacks with our Angel Jade subsidiary. In addition, the government has imposed new requirements which would require us to hire a registered Mine Manager and limits the extraction volumes allowed under an exploration lease to 1 ton per year. Moreover, the Mining Department has been slow to renew our exploration license for the current period. As a result of the foregoing difficulties, we are reviewing our current opportunities and analyzing whether whether Angel Jade is in alignment with the financial model required by the Company. We are exited about the opportunity to takeover of the management of Paradise Gardens and its timber operation. In fact, all of our revenue from the year ended September 30, 2015 was generated from the management agreement with Paradise Gardens. The management agreement provides us, through our subsidiary Aqua Mining, with the opportunity to develop the current logging areas under permit, to develop new areas for logging outside the existing area permit area, and to spread the customer base from the existing to now incorporate retail, contract felling and long term commercial orders. In December 2015, we established a small lumber outlet in Port Moresby to serve the local construction industry. We are now seeking to acquire ownership of Paradise Gardens and/or other timber assets in Papua New Guinea. The Company had $32,000 in revenue for the year ended September 30, 2015 and no revenue for the year ended September 30, 2014. The increase in revenue of $32,000 is attributable to the sale of timber under the management agreement with Paradise Gardens. The Company had a net operating loss of $1,211,666 for the year ended September 30, 201 compared with a net operating loss of $818,588 for the year ended September 30, 2014. The increase of $393,078 was primarily attributable to the costs associated with getting the timber logging operations up to date, starting works on the infrastructure at Koranga and additional administrative expense. Net cash used in operating activities was $925,853 for the year ended September 30, 2015 compared to net cash used in operating activities of $193,239 for the year ended September 30, 2014. The increase of $732,614 was a result mainly from in part to the costs associated with getting the timber logging operations up to date, starting works on the infrastructure at Koranga and additional administrative expense. Net cash used in investing activities was $17,050 for the year ended September 30, 2015 compared to $92,586 for the year ended September 30, 2014. This increase resulted from the acquisition of Instacash which is no longer operated by the Company. Net cash provided by financing activities was $1,353,993 for the year ended September 30, 2015 compared to $1,651,454 for the year ended September 30, 2014.The decrease of $297,455 was mainly due to a decrease in cost of financing. As of September 30, 2015, the Company had total current assets of $105,496 and total current liabilities of $1,923,196 resulting in a working capital deficit of $1,817,699. As of September 30, 2014, the Company had total current assets of $236,280 and total current liabilities of $1,745,730 resulting in a working capital deficit of $1,509,450. The increase in working capital deficit arose mainly due to increase in loans owing to related parties, who provided advances to the Company for working capital purposes. The Company had cash as of September 30, 2015 of $10,763. The Company intends to fund its exploration through the sale of its equity securities. However, there can be no assurance that the Company will be successful doing so. We currently have no agreements, arrangements or understandings with any person to obtain funds through bank loans, lines of credit or any other sources. We currently believe that the Company will need approximately $2,000,000 over the next 12 months to implement our desired expansion of mining activities. The Company is in the development stage and has insufficient revenues to cover its operating costs. As of September 30, 2015, the Company had an accumulated deficit of $10,986,677 and a working capital deficiency and insufficient cash resources to meet its planned business objectives. These and other factors raise substantial doubt about the Company's ability to continue as a going concern. Management's plan for our continued existence includes selling additional stock through private placements and borrowing additional funds to pay overhead expenses while maintaining marketing efforts to raise our sales volume. Our future success is dependent upon our ability to achieve profitable operations, generate cash from operating activities and obtain additional financing. There is no assurance that we will be able to generate sufficient cash from operations, sell additional shares of common stock or borrow additional funds. Our inability to obtain additional cash could have a material adverse effect on our financial position, results of operations and our ability to continue as a going concern. We have only had operating losses which raise substantial doubts about our viability to continue our business and our auditors have issued an opinion expressing the uncertainty of our Company to continue as a going concern. If we are not able to continue operations, investors could lose their entire investment in our Company. The Company is not party to any contractual obligations other than indicated in Notes 5 and 6. We have no off balance sheet arrangements other than as described above. We have not entered into any other financial guarantees or other commitments to guarantee the payment obligations of any third parties. We have not entered into any derivative contracts that are indexed to our shares and classified as shareholder's equity or that are not reflected in our consolidated financial statements. Furthermore, we do not have any retained or contingent interest in assets transferred to an unconsolidated entity that serves as credit, liquidity or market risk support to such entity. We do not have any variable interest in any unconsolidated entity that provides financing, liquidity, market risk or credit support to us or engages in leasing, hedging or research and development services with us. We have audited the accompanying balance sheet of Kibush Capital Corporation as of September 30, 2015 and 2014 and the related consolidated statements of operations, changes in stockholders' deficit and cash flows for the years then ended. These financial statements are the responsibility of the Company management. Our responsibility is to express an opinion on these financial statements based on our audit. In our opinion, the financial statements referred to above present fairly, in all material respects, the financial position of Kibush Capital Corporation at September 30, 2015 and 2014, and the results of their operations and their cash flows for the years then ended in conformity with accounting principles generally accepted in the United States of America. The accompanying financial statements have been prepared assuming that Kibush Capital Corporation will continue as a going concern. As more fully described in Note 4, the Company had an accumulated deficit at September 30, 2015 and 2014, a net loss and net cash used in operating activities for the fiscal year then ended. These conditions raise substantial doubt about the ability of the Company to continue as a going concern. Management's plans in regards to these matters are also described in Note 4. The financial statements do not include any adjustments to reflect the possible future effects on the recoverability and classification of assets or the amounts and classification of liabilities that may result from the outcome of this uncertainty. "See notes to financial statements"
Kibush Capital Corporation (formerly David Loren Corporation) (the "Company") includes 90% owned subsidiary Aqua Mining (PNG), and its 70% owned subsidiary Angel Jade Pty, Ltd. See Basis of Presentation below. The Company has two primary businesses: (i) mining exploration within Aqua Mining and Angel Jade, and (ii) management services currently operated by Aqua Mining. The Company maintains its accounting records on an accrual basis in accordance with generally accepted accounting principles in the United States of America ("U.S. GAAP"). The consolidated financial statements of the Company include the accounts of the Company, and all entities in which a direct or indirect controlling interest exists through voting rights or qualifying variable interests. All intercompany balances and transactions have been eliminated in the consolidated financial statements. The Board of Directors of the Company approved on September 14, 2014, a change in the Company's fiscal year end from December 31 to September 30 of each year. The accompanying financial statements have been prepared assuming that the Company will continue as a going concern, which contemplates the realization of assets and the liquidation of liabilities in the normal course of business. As at September 30, 2014, the Company has an accumulated deficit of $10,332,404 and $9,172,862 as of September 30, 2015 and has not earned sufficient revenues to cover operating costs since inception and has a working capital deficit. The Company intends to fund its mining exploration through equity financing arrangements, which may be insufficient to fund its capital expenditures, working capital and other cash requirements for the year. The ability of the Company to emerge from the development stage is dependent upon, among other things, obtaining additional financing to continue mining exploration and execution of its business plan. In response to these problems, management intends to raise additional funds through public or private placement offerings. These factors, among others, raise substantial doubt about the Company's ability to continue as a going concern. The accompanying financial statements do not include any adjustments that might result from the outcome of this uncertainty. The consolidated financial statements are presented in U.S. Dollars. The Company's functional currency is the U,S, Dollar. The functional currency of Angel Jade is the Australian dollar. Assets and liabilities are translated using the exchange rate on the respective balance sheet dates. Items in the income statement and cash flow statement are translated into U.S. Dollars using the average rates of exchange for the periods involved. The resulting translation adjustments are recorded as a separate component of other comprehensive income/(loss) within stockholders' equity. The functional currency of foreign entities is generally the local currency unless the primary economic environment requires the use of another currency. Gains or losses arising from the translation or settlement of foreign-currency-denominated monetary assets and liabilities into the functional currency are recognized in the income in the period in which they arise. However, currency differences on intercompany loans that have the nature of a permanent investment are accounted for as translation differences as a separate component of other comprehensive income/(loss) within stockholders' equity. The Company maintains its cash balances in interest and non-interest bearing accounts which do not exceed Federal Deposit Insurance Corporation limits. The accompanying consolidated financial statements include the accounts of Kibush Capital and Instacash. All intercompany accounts and transactions have been eliminated. FASB ASC 220-10-05, Comprehensive Income, establishes standards for the reporting and display of comprehensive income and its components in a full set of general-purpose financial statements. Comprehensive income is defined to include all changes in equity except those resulting from investments by owners and distribution to owners. The accompanying consolidated financial statements are presented in United States dollars. Reclassifications have been made to prior year consolidated financial statements in order to conform the presentation to the statements as of and for the period ended September 30, 2014. On June 10, 2014, the FASB issued Accounting Standards Update (ASU) No. 2014-10, Development Stage Entities (Topic 915) - Elimination of Certain Financial Reporting Requirements, Including an Amendment to Variable Interest Entities Guidance in Topic 810, Consolidation, which eliminates the concept of a development stage entity (DSE) in its entirety from current accounting guidance. The Company has elected early adoption of this new standard. The preparation of financial statements in conformity with Generally Accepted Accounting Principles in the United States of America ("GAAP") requires management to make certain estimates and assumptions that affect the reported amounts of assets and liabilities and disclosure of contingent assets and liabilities at the date of the financial statements and the reported amounts of revenues and expenses during the reporting period. Significant estimates made by management are, recoverability of long-lived assets, valuation and useful lives of intangible assets, valuation of derivative liabilities, and valuation of common stock, options, warrants and deferred tax assets. Actual results could differ from those estimates. Investments in associated companies over which the Company has the ability to exercise significant influence are accounted for under the consolidation method, after appropriate adjustments for intercompany profits and dividends. In December 2007, the FASB issued SFAS No. 141(R), "Business Combinations." It requires an acquirer to recognize, at the acquisition date, the assets acquired, the liabilities assumed, and any non-controlling interest in the acquiree at their full fair values as of that date. In a business combination achieved in stages (step acquisitions), the acquirer will be required to re-measure its previously held equity interest in the acquiree at its acquisition-date fair value and recognize the resulting gain or loss in earnings. The acquisition-related transaction and restructuring costs will no longer be included as part of the capitalized cost of the acquired entity but will be required to be accounted for separately in accordance with applicable generally accepted accounting principles. U.S. SFAS No. 141(R) applies prospectively to business combinations for which the acquisition date is on or after the beginning of the first annual reporting period beginning on or after December 15, 2008. A non-controlling interest in a subsidiary is an ownership interest in a consolidated entity that is reported as equity in the consolidated financial statements and separate from the Company's equity. In addition, net income/(loss) attributable to non-controlling interests is reported separately from net income attributable to the Company in the consolidated financial statements. The Company's consolidated statements present the full amount of assets, liabilities, income and expenses of all of our consolidated subsidiaries, with a partially offsetting amount shown in non-controlling interests for the portion of these assets and liabilities that are not controlled by us. For our investments in affiliated entities that are included in the consolidation, the excess cost over underlying fair value of net assets is referred to as goodwill and reported separately as "Goodwill" in our accompanying consolidated balance sheets. Goodwill may only arise where consideration has been paid. Maintenance and repairs are charged to expense as incurred. Renewals and improvements of a major nature are capitalized. At the time of retirement or other disposition of property and equipment, the cost and accumulated depreciation are removed from the accounts and any resulting gains or losses are reflected in the consolidated statement of operations. If the Company determines that the carrying values of long-lived assets may not be recoverable based upon the existence of one or more of the above indicators of impairment, the Company's management performs an undiscounted cash flow analysis to determine if impairment exists. If impairment exists, the Company measures the impairment based on the difference between the asset's carrying amount and its fair value, and the impairment is charged to operations in the period in which the long-lived asset impairment is determined by management. The carrying value of the Company's investment in Joint Venture contract with leaseholders of certain Mining Leases in Papua New Guinea represents its ownership, accounted for under the equity method. The ownership interest is not adjusted to fair value on a recurring basis. Each reporting period the Company assesses the fair value of the Company's ownership interest in Joint Venture in accordance with FASB ASC 325-20-35. Each year the Company conducts an impairment analysis in accordance with the provisions within FASB ASC 320-10-35 paragraphs 25 through 32. In accordance with FASB ASC 470-20, Accounting for Convertible Securities with Beneficial Conversion Features or Contingently Adjustable Conversion Ratios, we recognize the advantageous value of conversion rights attached to convertible debt. Such rights give the debt holder the ability to convert debt into common stock at a price per share that is less than the trading price to the public on the day the loan is made to us. The beneficial value is calculated as the intrinsic value (the market price of the stock at the commitment date in excess of the conversion rate) of the beneficial conversion feature of debentures and related accruing interest is recorded as a discount to the related debt and an addition to additional paid in capital. The discount is amortized over the remaining outstanding period of related debt using the interest method. We apply the provisions of FASB ASC 815-10, Derivatives and Hedging ("ASC 815-10"). Derivatives within the scope of ASC 815-10 must be recorded on the balance sheet at fair value. During the year ended September 30, 2014, the Company issued convertible debt and recorded derivative liabilities related to a reset provision associated with the embedded conversion feature of the convertible debt. The Company computed the fair value of these derivative liabilities on the grant date and various measurement dates using the Black-Scholes pricing model. Due to the reset provisions within the embedded conversion feature, the Company determined that the Black-Scholes pricing model was the most appropriate for valuing these instruments. The inputs used to measure fair value fall in different levels of the fair value hierarchy, a financial security's hierarchy level is based upon the lowest level of input that is significant to the fair value measurement. Level 1 - Valuation based on unadjusted quoted market prices in active markets for identical securities. Currently, the Company does not have any items as Level 1. Level 2 - Valuations based on observable inputs (other than Level 1 prices), such as quoted prices for similar assets at the measurement date; quoted prices in markets that are not active; or other inputs that are observable, either directly or indirectly. Currently, the Company does not have any items classified as Level 2. Level 3 - Valuations based on inputs that are unobservable and significant to the overall fair value measurement, and involve management judgment. The Company used the Black-Scholes option pricing models to determine the fair value of the instruments. The Company re-measures the fair values of all of its derivative liabilities as of each period end and records the net aggregate gain/loss due to the change in the fair value of the derivative liabilities as a component of other expense, net in the accompanying consolidated statement of operations. During the years ended September 30, 2015 and 2014, the Company recorded a net increase (decrease) to the fair value of derivative liabilities balance of $131,044 and $(92,382), respectively. The Company applies FASB ASC 260, "Earnings per Share." Basic earnings (loss) per share is computed by dividing earnings (loss) available to common stockholders by the weighted-average number of common shares outstanding. Diluted earnings (loss) per share is computed similar to basic earnings (loss) per share except that the denominator is increased to include additional common shares available upon exercise of stock options and warrants using the treasury stock method, except for periods for which no common share equivalents are included because their effect would be anti-dilutive. Income taxes are accounted for in accordance with ASC Topic 740, "Income Taxes." Under the asset and liability method, deferred tax assets and liabilities are recognized for the future consequences of differences between the financial statement carrying amounts of existing assets and liabilities and their respective tax bases (temporary differences). Deferred tax assets and liabilities are measured using tax rates expected to apply to taxable income in the years in which those temporary differences are recovered or settled. Valuation allowances for deferred tax assets are established when it is more likely than not that some portion or all of the deferred tax assets will not be realized. Pursuant to EITF 04-02, "Whether Mineral Rights are Tangible or Intangible Assets and Related Issues", the Company has an accounting policy to capitalize the direct costs to acquire or lease mineral properties and mineral rights as tangible assets. The direct costs include the costs of signature (lease) bonuses, options to purchase or lease properties, and brokers' and legal fees. If the acquired mineral rights relate to unproven properties, the Company does not amortize the capitalized mineral costs, but evaluates the capitalized mineral costs periodically for impairment. The Company expenses all costs related to the exploration of mineral claims in which it had secured exploration rights prior to establishment of proven and probable reserves. At this time, the Company does not directly own or directly lease mining properties. However, the Company does have contractual rights and governmental permits which allow the Company to conduct mining exploration on the properties referenced in this report. These contractual relationships, coupled with the government permits issued to the Company (or a subsidiary), are substantially similar in nature to a mining lease. Therefore, we have treated these contracts as lease agreements from an accounting prospective. Research and development costs are recognized as an expense in the period in which they are incurred. The Company incurred no research and development costs for the years ended September 30, 2015 and 2014, respectively. Development State Entities. In June 2014, the Financial Accounting Standards Board ("FASB") issued Accounting Standards Update 2014-10 - Development Stage Entities (Topic 915): Elimination of Certain Financial Reporting Requirements, Including an Amendment to Variable Interest Entities Guidance in Topic 810, Consolidation ("ASU 2014-10"). The amendments in this update remove the definition of a development stage entity from the Master Glossary of the Accounting Standards Codification. In addition, the amendments eliminate the requirements for development stage entities to (1) present inception-to-date information in the statements of income, cash flows, and shareholder equity, (2) label the financial statements as those of a development stage entity, (3) disclose a description of the development stage activities in which the entity is engaged, and (4) disclose in the first year in which the entity is no longer a development stage entity that in prior years it had been in the development stage. For public business entities, those amendments are effective for annual reporting periods beginning after December 15, 2014, and interim periods therein. For other entities, the amendments are effective for annual reporting periods beginning after December 15, 2014, and interim reporting periods beginning after December 15, 2015. Early application of each of the amendments is permitted for any annual reporting period or interim period for which the entity's financial statements have not yet been issued (public business entities) or made available for issuance (other entities). Upon adoption, entities will no longer present or disclose any information required by Topic 915. The Company has early adopted ASU 2014-10 commencing with its financial statements for the year ended September 30, 2014 and subsequent periods. In May 2014, the Financial Accounting Standards Board (FASB) issued an Accounting Standards Update (ASU) which provides guidance for accounting for revenue from contracts with customers. The core principle of this ASU is that an entity should recognize revenue to depict the transfer of promised goods or services to customers in an amount that reflects the consideration the entity expects to be entitled in exchange for those goods or services. To achieve that core principle, an entity would be required to apply the following five steps: 1) identify the contract(s) with a customer; 2) identify the performance obligations in the contract; 3) determine the transaction price; 4) allocate the transaction price to the performance obligations in the contract; and 5) recognize revenue when (or as) the entity satisfies a performance obligation. The ASU is effective for fiscal years, and interim periods within those years, beginning after December 15, 2016. Early adoption is not permitted. Entities will have the option to apply the final standard retrospectively or use a modified retrospective method, recognizing the cumulative effect of the ASU in retained earnings at the date of initial application. An entity will not restate prior periods if it uses the modified retrospective method, but will be required to disclose the amount by which each financial statement line item is affected in the current reporting period by the application of the ASU as compared to the guidance in effect prior to the change, as well as reasons for significant changes. The Company will adopt the updated standard in the first quarter of 2017. The Company is currently evaluating the impact that implementing this ASU will have on its financial statements and disclosures, as well as whether it will use the retrospective or modified retrospective method of adoption. Company management do not believe that the adoption of recently issued accounting pronouncements will have a significant impact on the Company's financial position, results of operations, or cash flows. The Company owns interests in the following entities which was recorded at their book value since they were related party common control acquisitions. As the Subsidiaries Angel Jade Pty Ltd and Aqua Mining (PNG) Ltd were acquired from a related entity, Five Arrows Limited (see Note 9 - Business Combinations), the shares were recorded in the accounts at their true cost value. Depreciation expense was approximately $5,604 for the year ended September 30, 2015 and $16,982 for the year ended September 30, 2014. On May 1, 2011, the Company issued a 2.00% Convertible Note due April 30, 2012 with a principal amount of $32,000 (the "2011 Note") for cash. Interest on the 2011 Note is accrued annually effective from May 1, 2011 forward. The 2011 Note is unsecured and repayable on demand. The 2011 Note is senior in right to all existing and future indebtedness which is subordinated by its terms and at the option of the Lender, the principal along with any accrued interest may be converted in whole or part into Common Stock at a price of $0.001. As this note carries a conversion rate that is less than market rate, the rules of beneficial conversion apply. The difference between the conversion rate and the market rate is classified as a discount on the note and accreted over the term of the note, which with respect to this note is 12 months. The face amount of the outstanding note as of September 30, 2015 and September 30, 2014 is $22,166 and $28,726 respectively. As of September 30, 2015 and September 30, 2014, the note has been discounted by $0. On January 2, 2012, the Company issued a 2.00% Convertible Note due January 1, 2013 with a principal amount of $48,000 (the "2012 Note") for cash. Interest on the 2012 Note is accrued annually effective from January 2, 2012 forward. The 2012 Note is unsecured and repayable on demand. The 2012 Note is senior in right to all existing and future indebtedness which is subordinated by its terms and at the option of the Lender, the principal along with any accrued interest may be converted in whole or part into Common Stock at a price of $0.001. As this note carries a conversion rate that is less than market rate, the rules of beneficial conversion apply. The difference between the conversion rate and the market rate is classified as a discount on the note and accreted over the term of the note, which with respect to this note is 12 months. The face amount of the outstanding note as of September 30, 2015 is $48,000 respectively. As of September 30, 2015, the note has been discounted by $0. On January 3, 2013, the Company issued a 2.00% Convertible Note due January 2, 2014 with a principal amount of $12,000 (the "2013 Note") for cash. Interest on the 2013 Note is accrued annually effective from January 3, 2013 forward. The 2013 Note is unsecured and repayable on demand. The 2013 Note is senior in right to all existing and future indebtedness which is subordinated by its terms and at the option of the Lender, the principal along with any accrued interest may be converted in whole or part into Common Stock at a price of $0.001. As this note carries a conversion rate that is less than market rate, the rules of beneficial conversion apply. The difference between the conversion rate and the market rate is classified as a discount on the note and accreted over the term of the note, which with respect to this note is 12 months. The face amount of the outstanding note as of September 30, 2015 is $12,000. As of September 30, 2015 the note has been discounted by $0. On August 25, 2014, the Company issued two 12.00% Convertible Promissory Note due February 25, 2015 with a principal amount of $50,000 each (the "2014 Note") for cash. Interest on the 2014 Note is accrued annually effective from August 25, 2014 forward. The 2014 Note is unsecured. The notes are convertible at a conversion price the lesser of (a) $0.25 per share, or (b) the price per share as reported on the Over-the-Counter Bulletin Board on the conversion date. The Note Holders also received Warrants to purchase an aggregate of 800,000 shares of our common stock at an initial exercise price of $0.25 per share. Each of the Warrants has a term of five (5) years. The embedded conversion feature of the 2014 Notes and Warrants were recorded as derivative liabilities in accordance with relevant accounting guidance due to the variable conversion price of the 2014 Notes. The fair value on the grant date of the embedded conversion feature of the convertible debt was $145,362 as computed using the Black-Scholes option pricing model. The Company established a debt discount of $100,000, representing the value of the embedded conversion feature inherent in the convertible debt and warrant, as limited to the face amount of the debt. The debt discount is being amortized over the life of the debt using the straight-line method over the terms of the debt, which approximates the effective-interest method. For the year ended September 30, 2014, the Company recorded amortization of the debt discount of $19,566. The balance of the debt discount was $80,434 at September 30, 2014. For the year ended September 30, 2015, the Company recorded amortization of the debt discount of $0. The balance of the debt discount was $0 at September 30, 2015. On March 31, 2014, the Company issued a 12.50% Convertible Promissory Note due March 31, 2015 with a principal amount of $157,500 (the "March 2014 Note") for cash. Interest on the March 2014 Note is accrued annually effective from March 31, 2014 forward. The March 2014 Note is unsecured. The note is convertible into common stock at a price of 50 percent of the average closing bid price, determined on the then current trading market for the ten business days prior to the conversion date. The embedded conversion feature of the March 2014 Notes was recorded as derivative liabilities in accordance with relevant accounting guidance due to the variable conversion price of the March 2014 Notes. The fair value on the grant date of the embedded conversion feature of the convertible debt was $305,039 as computed using the Black-Scholes option pricing model. The Company established a debt discount of $157,500, representing the value of the embedded conversion feature inherent in the convertible debt, as limited to the face amount of the debt. The debt discount is being amortized over the life of the debt using the straight-line method over the terms of the debt, which approximates the effective-interest method. For the year ended September 30, 2014, the Company recorded amortization of the debt discount of $78,966. The balance of the debt discount was $78,534 at September 30, 2014. As of September 30, 2015, the balance of the debt discount was $0. On June 30, 2014, the Company issued a 12.50% Convertible Promissory Note due June 30, 2015 with a principal amount of $110,741 (the "June 2014 Note") for cash. Interest on the June 2014 Note is accrued annually effective from June 30, 2014 forward. The June 2014 Note is unsecured. The note is convertible into common stock at a price of 50 percent of the average closing bid price, determined on the then current trading market for the ten business days prior to the conversion date. The embedded conversion feature of the June 2014 Note was recorded as derivative liabilities in accordance with relevant accounting guidance due to the variable conversion price of the June 2014 Note. The fair value on the grant date of the embedded conversion feature of the convertible debt was $213,207 as computed using the Black-Scholes option pricing model. The Company established a debt discount of $110,741 representing the value of the embedded conversion feature inherent in the convertible debt, as limited to the face amount of the debt. The debt discount is being amortized over the life of the debt using the straight-line method over the terms of the debt, which approximates the effective-interest method. For the year ended September 30, 2014, the Company recorded amortization of the debt discount of $27,913. The balance of the debt discount was $82,828 at September 30, 2014. As of September 30, 2015, the balance of the debt discount was $0. On September 30, 2014, the Company issued a 12.50% Convertible Promissory Note due September 30, 2015 with a principal amount of $98,575 (the "September 2014 Note") for cash. Interest on the September 2014 Note is accrued annually effective from September 30, 2014 forward. The September 2014 Note is unsecured. The note is convertible into common stock at a price of 50 percent of the average closing bid price, determined on the then current trading market for the ten business days prior to the conversion date. The embedded conversion feature of the September 2014 Notes was recorded as derivative liabilities in accordance with relevant accounting guidance due to the variable conversion price of the September 2014 Note. The fair value on the grant date of the embedded conversion feature of the convertible debt was $181,771 as computed using the Black-Scholes option pricing model. The Company established a debt discount of $98,575 representing the value of the embedded conversion feature inherent in the convertible debt, as limited to the face amount of the debt. The debt discount is being amortized over the life of the debt using the straight-line method over the terms of the debt, which approximates the effective-interest method. For the year ended September 30, 2014, the Company recorded amortization of the debt discount of $0. The balance of the debt discount was $98,575 at September 30, 2014. As of September 30, 2015, the balance of the debt discount was $0. As of September 30, 2014 and 2013, cumulative interest of $96,579 and $0 respectively, has been accrued on these notes. The Company established a debt discount of $61,273 representing the value of the embedded conversion feature inherent in the convertible debt, as limited to the face amount of the debt. The debt discount is being amortized over the life of the debt using the straight-line method over the terms of the debt, which approximates the effective-interest method. For the year ended September 30, 2015, the Company recorded amortization of the debt discount of $0. The balance of the debt discount was $0 at September 30, 2015. On August 22, 2013, the Company's Board authorized a 225:1 reverse stock split. All share and per share data in the accompanying financial statements and footnotes has been adjusted retrospectively for the effects of the stock split. On October 12, 2013, the Company issued by directors resolution, 10,000,000 shares of newly issued common stock for the purchase of a Memorandum of Understanding (dated September 2, 2013) from a related company (Five Arrows Limited); which gave Kibush Capital Corporation the right to acquire 80% ownership in Instacash Pty Ltd, an Australian Currency Services provider, and corporate trustee of the Instacash Trust. As this transaction was with a related party, the value was recorded at the par value of the stock i.e. $0.001 per share of common stock. Between October 23, 2013 and September 30, 2014, the Company issued a total of 3,274,000 shares of common stock upon the requests from convertible note holders to convert principal totaling $3,274 into the Company's common stock based on the terms set forth in the loans. The conversion rate was $0.001. On February 28, 2014, the Company issued by director's resolution, 40,000,000 shares of newly issued common stock to conclude a Assignment and Bill of Sale (dated February 14, 2014) from a related company (Five Arrows Limited); which gave Kibush Capital Corporation the right to enter into a Joint Venture contract with the leaseholders of certain Mining Leases in Papua New Guinea. As this transaction was with a related party, the value was recorded at par value of the stock i.e. $0.001 per share of common stock. Between November 1, 2014 and March 31, 2015, the Company issued a total of 4,560,000 shares of common stock upon the requests from convertible note holders to convert principal totaling $3,274 into the Company's common stock based on the terms set forth in the loans. The conversion rate was $0.001. Preferred stock includes 50,000,000 shares authorized at $0.001 par value, of which 10,000,000 have been designated Series A. 3,000,000 Series A are issued and outstanding as of September 30, 2014 and September 30, 2015. The Company provided a valuation allowance equal to the deferred income tax assets for period ended September 30, 2014 because it is not presently known whether future taxable income will be sufficient to utilize the loss carryforwards. As of September 30, 2015, the Company had approximately $10,986,677 in tax loss carryforwards that can be utilized future periods to reduce taxable income, and the carryforward incurred for the year ended September 30, 2015 will expire by the year 2035. The federal income tax returns of the Corporation are subject to examination by the IRS, generally for three years after they are filed. Details of transactions between the Corporation and related parties are disclosed below. (a) From time to time, the president and stockholder of the Company provides advances to the Company for its working capital purposes. These advances bear no interest and are due on demand. (b) See Note 6 for details of Convertible notes. (c) On April 29, 2015, the Company issued 3,001,702 shares of its common stock to Warren Sheppard (previously authorized by for issuance by the company on December 10, 2014) pursuant to his employment agreement. (d) Between April 1, 2015 and June 24, 2015, the Company issued a total of 4,000,000 shares of common stock upon the requests from convertible note holders to convert principal totaling $4,000 into the Company's common stock based on the terms set forth in the loans. The conversion rate was $0.001. (e) The Company has entered into related party acquisitions. Details of these transactions are provided therewith Five Arrows, as described in more detail in Note 10 below. Set out below are the controlled and non-controlled members of the group as of September 30, 2015, which, in the opinion of the directors, are material to the group. The subsidiaries as listed below have share capital consisting solely of ordinary shares, which are held directly by the Company; the country of incorporation is also their principal place of business. Note 1: On February 14, 2014, the Company entered into an Assignment and Bill of Sale with Five Arrows Limited ("Five Arrows"), a related party, pursuant to which Five Arrows agreed to assign to the Company all of its right, title and interest in two 50 ton per hour trammels, one 35 ton excavator, a warehouse/office, a concrete processing apron and four 35 ton per hour particle concentrators for use in our mining exploration. In consideration, the Company issued 40,000,000 shares of its common stock to Five Arrows. On February 28, 2014, the Company entered into a joint venture agreement with the holders of alluvial gold mining leases ("Leaseholders") of Mining Leases covering approximately 26 hectares located at Koranga in Wau, Morobe Province, Papua, New Guinea for gold mining exploration ("Joint Venture Agreement"). The Joint Venture Agreement entitles the leaseholders to 30% and the Company to 70% of net profits from the joint venture. The Company will manage and carry out mining exploration at the site, including entering into contracts with third parties and subcontractors (giving priority to the Leaseholders and their relatives and the local community for employment opportunities and spin-off business) at its cost, and all assets, including equipment and structures built on the site, will be the property of the Company. The Leaseholders and the Company will each contribute 1% from their share of net profits to a trust account for landowner and government requirements. On July 27, 2015, we recently received a 5-year extension for our Mining Lease of ML 296-301 from the Mining Resource Authority in Papua New Guinea. ML 296-301 is part of the Koranga Joint Venture and is controlled by our subsidiary Aqua Mining. Note 2: On December 10, 2014, the Company entered into an Assignment and Bill of Sale with Five Arrows Limited, a related party, pursuant to which Five Arrows agreed to assign to the Company all of its right, title and interest in 90,000,000 shares in Angel Jade Pty Ltd. In consideration, the Company issued 14,000,000 shares of its common stock to Five Arrows. Management evaluated all activity of the Company through the date of the Financial Statements were available to be issued and noted there were no material subsequent events which require recognition or disclosure as of that date. Our financial statements for the fiscal years ended September 30, 2014 and September 30, 2015, included in this report, have been audited by Scrudato & Co., PA. There have been no disagreements on accounting and financial disclosures with Scrudato & Co., PA through the date of this Form 10-K.
Our management, does not expect that our Disclosure Controls and internal controls will prevent all errors and all fraud. A control system, no matter how well conceived and operated, can provide only reasonable, not absolute, assurance that the objectives of the control system are met. Further, the design of a control system must reflect the fact that there are resource constraints, and the benefits of controls must be considered relative to their costs. Because of the inherent limitations in all control systems, no evaluation of controls can provide absolute assurance that all control issues and instances of fraud, if any, within the Company have been detected. These inherent limitations include the realities that judgments in decision-making can be faulty, and that breakdowns can occur because of a simple error or mistake. Additionally, controls can be circumvented by the individual acts of some persons, by collusion of two or more people, or by management or board override of the control. Our management is responsible for establishing and maintaining adequate internal control over financial reporting. Internal control over financial reporting is defined in Rule 13a-15(f) or 15d-15(f) promulgated under the Securities Exchange Act of 1934 as a process designed by, or under the supervision of, the company's principal executive and principal financial officers and effected by the company's board of directors, management and other personnel, to provide reasonable assurance regarding the reliability of financial reporting and the preparation of financial statements for external purposes in accordance with accounting principles generally accepted in the United States of America. All internal control systems, no matter how well designed, have inherent limitations. Therefore, even those systems determined to be effective can provide only reasonable assurance with respect to financial statement preparation and presentation. Because of the inherent limitations of internal control, there is a risk that material misstatements may not be prevented or detected on a timely basis by internal control over financial reporting. However, these inherent limitations are known features of the financial reporting process. Therefore, it is possible to design into the process safeguards to reduce, though not eliminate, this risk. We do not have written documentation of our internal control policies and procedures. Written documentation of key internal controls over financial reporting is a requirement of Section 404 of the Sarbanes-Oxley Act which is applicable to us. Management evaluated the impact of our failure to have written documentation of our internal controls and procedures on our assessment of our disclosure controls and procedures and has concluded that the control deficiency that resulted represented a material weakness. The Company's board of directors has no audit committee, independent director or member with financial expertise which causes ineffective oversight of the Company's external financial reporting and internal control over financial reporting. Due to these factors, during the period covered by this report, our internal controls and procedures were not effective to detect the inappropriate application of US GAAP rules as more fully described below. Most notably, we failed to convert reporting to an interested party standard for certain balance sheet items once we exceeded the applicable threshold which affected our balance sheet for the quarter ended June 30, 2015. Management believes that the material weakness set forth above caused a material misstatement in our Form 10-Q for the period ended June 30, 2015. Therefore, we are promptly amending that report. Management believes they have corrected some of the conditions which allowed for the misstatement. However, the lack of a functioning audit committee, the lack of segregation of duties within accounting functions, and the lack of multiple directors on our board of directors may result in ineffective oversight in the establishment and monitoring of required internal controls and procedures, which could result in a material misstatement in our financial statements in future periods. The Company plans to add additional directors, add accounting personnel and establish an audit committee over time, once it has sufficient income and cash flow to make those changes. This annual report does not include an attestation report of our registered public accounting firm regarding internal control over financial reporting. Management's report was not subject to attestation by our registered public accounting firm because we are a smaller reporting company. Appearing immediately following the Signatures section of this report there is Certification of our CEO/CFO. The Certification is required in accordance with Section 302 of the Sarbanes-Oxley Act of 2002 (the Section 302 Certifications). This Item of this report, which you are currently reading is the information concerning the Evaluation referred to in the Section 302 Certifications and this information should be read in conjunction with the Section 302 Certifications for a more complete understanding of the topics presented. There were no changes in our internal control over financial reporting during the year ended September 30, 2015 that have affected, or are reasonably likely to affect, our internal control over financial reporting. Our directors hold office until the next annual general meeting of the stockholders or until their successors are elected and qualified. Our officers are appointed by our board of directors and hold office until their earlier death, retirement, resignation or removal. Warren Sheppard has served as our President, Chief Executive Officer and director since July 5, 2013. Mr. Sheppard has had an Accountancy Practice, primarily tax based in Australia for approximately the last 30 years. In addition Mr. Sheppard also has served in an oversight capacity as Chief Executive Officer of Q6 Pty Ltd., a software development company, from 2005 to date, and in an oversight capacity as Chief Financial Officer of Uniware Pty Ltd., an accounting software company, from 2001 to date; Westvantage Pty Ltd., a software company, from 2011 to date; Xceed Pty Ltd., an internet development company, from 2001 to date; Ozisp Pty Ltd., an internet service provider company, from 2001 to date; and Altius Mining Ltd., a gold exploration mining company from 2008 to 2011, devoting a few hours per month to these entities, none of which compete with the Company. Mr. Sheppard has served as director of several Australian private companies as well as serving as Trustee of the Australian Aiding Australia Trust, More Superannuation Fund and McMahon Superannuation Fund. Mr. Sheppard's accounting background as well as his experience serving as chief executive officer and chief financial officer and director of various Australian private companies led to his appointment to the board of directors. Vincent Appo has been mining manager of the Company since October 2013. Prior thereto, from June 2012 to November 2013, Mr. Appo was the Mine Operations Manager/Acting General Manager for Tolukuma Gold Mines Limited in Papua, New Guinea. Mr. Appo served as Consulting Survey Project Manager for Dempsey Australia Ltd, Papua, New Guinea from May 2011 to December 2011, and Mine Technical Services Manager/Acting Mine General Manager for Tolukuma Gold Mines Limited from January 2011 to July 2011 and for other gold mines in Papua, New Guinea in various positions since 2002. From 1997 to 2002, Mr. Appo was Chief Surveyor for two companies in New Guinea. Mr. Appo also serves as director of Aqua Mining, a subsidiary of the Company. Neither Mr. Sheppard nor Mr. Appo are directors in any other U.S. reporting companies nor have they been affiliated with any company that has filed for bankruptcy within the last ten years. The Company is not aware of any proceedings to which he or any of his associates is a party adverse to the Company or any of the Company's subsidiaries or has a material interest adverse to it or any of its subsidiaries. Vincent Appo has been mining manager of the Company since October 2013. Prior thereto, from June 2012 to November 2013, Mr. Appo was the Mine Operations Manager/Acting General Manager for Tolukuma Gold Mines Limited in Papua, New Guinea. Mr. Appo served as Consulting Survey Project Manager for Dempsey Australia Ltd, Papua, New Guinea from May 2011 to December 2011, and Mine Technical Services Manager/Acting Mine General Manager for Tolukuma Gold Mines Limited from January 2011 to July 2011 and for other gold mines in Papua, New Guinea in various positions since 2002. From 1997 to 2002, Mr. Appo was Chief Surveyor for two companies in New Guinea. Section 16(a) of the Securities Exchange Act of 1934 requires our executive officers and directors, and persons who beneficially own more than 10% of our equity securities, to file reports of ownership and changes in ownership with the Securities and Exchange Commission. Officers, directors and greater than 10% shareholders are required by SEC regulation to furnish the Company with copies of all Section 16(a) forms they file. However, the Company is aware that certain Section 16 reports have not yet been filed. While our registration statement went effective on August 10, 2015, it appears Form 3s were not filed by Warren Sheppard, Vincent Appo and Five Arrows Limited. The Company has communicated with these parties and it understands that such filings are imminent. At this time, we are not subject to the listing requirements of any national securities exchange or national securities association and, as a result, we are not required to have our board comprised of a majority of "independent directors." Furthermore, we do not believe that our director currently meets the definition of "independent" as promulgated by the rules and regulations of the NYSE Alternext US (formerly known as the American Stock Exchange). We currently have one director who is also our chief executive. We do not have an audit or compensation committee comprised of independent directors, and the functions that would have been performed by such committees are performed by our Board of Directors. Thus, there is a potential conflict of interest in that our directors have the authority to determine issues concerning management compensation, in essence their own, and audit issues that may affect management decisions. We have no separately-designated audit committee. Audit committee functions are performed by our board of directors. None of our directors are deemed independent. All directors also hold positions as our officers. Our board of directors is responsible for: (1) selection and oversight of our independent accountant; (2) establishing procedures for the receipt, retention and treatment of complaints regarding accounting, internal controls and auditing matters; (3) establishing procedures for the confidential, anonymous submission by our employees of concerns regarding accounting and auditing matters; and (4) engaging outside advisors. Moreover, our Board of Directors has not established compensation or disclosure committees. We do not have an audit committee financial expert. We do not have an audit committee financial expert because we believe the cost related to retaining a financial expert at this time is prohibitive. Further, because we are only beginning our commercial operations, at the present time, we believe the services of a financial expert are not warranted. We have adopted a corporate code of ethics. We believe our code of ethics is reasonably designed to deter wrongdoing and promote honest and ethical conduct; provide full, fair, accurate, timely and understandable disclosure in public reports; comply with applicable laws; ensure prompt internal reporting of code violations; and provide accountability for adherence to the code. A copy of the code of ethics is filed as Exhibit 14.1 to this annual report on Form 10-K.
Was the subject of, or a party to, any sanction or order, not subsequently reversed, suspended or vacated, of any self-regulatory organization (as defined in Section 3(a)(26) of the Exchange Act (15 U.S.C. 78c(a)(26))), any registered entity (as defined in Section 1(a)(29) of the Commodity Exchange Act (7 U.S.C. 1(a)(29))), or any equivalent exchange, association, entity or organization that has disciplinary authority over its members or persons associated with a member. Mr. Sheppard was appointed president and CEO on May 20, 2013. Mr. Sheppard earned a salary of $250,000 during the fiscal years ended September 30, 2015 and September 30, 2014. Mr. Sheppard earned earned no bonuses during the fiscal year ended September 30, 2015 and earned bonuses of $450,000 for the year ended September 30, 2014. Since the Company did not have the ability to pay Mr. Sheppard's earnings in cash, he was compensated through the issuance of a convertible promissory note pursuant to the terms of his employment agreement. Mr. Sheppard's compensation for the fiscal year ended September 30, 2014 was converted into 3,001,702 shares of the Company's common stock on or about April 29, 2015. Mr. Sheppard's compensation for the fiscal year ended September 30, 2015 has not yet issued, but is convert into approximately 49,668,874 shares of the Company's common stock based on the year end closing price of $0.0151 per share. Mr. Sheppard has not waived his rights to these shares. Mr. Appo was appointed as operations manager on January 1, 2014 and became director of Aqua Mining on May 26, 2014. Mr. Appo earned a salary of $55,821 (156,000 PGK) during fiscal year 2015 and $71,703 (156,000 PGK) during fiscal year 2014. Warren Sheppard: At the beginning of the fiscal year ended September 30, 2014, we entered into an employment agreement, dated October 1, 2013, with Warren Sheppard to serve as our President and as a director. The initial term of the agreement is five years, which term shall automatically be renewed for additional two-year periods, unless the Company shall notify Mr. Sheppard at least 90 days prior to the expiration of the then current term or its desire not to renew the agreement. As the President, Mr. Sheppard receives an annual base salary of $250,000 which shall not be decreased except in connection with the reduction of the salaries of all executives of the Company. If the Company does not have sufficient funds to pay Mr. Sheppard's salary, he shall be paid in common stock of the Company in an amount equal to three times the amount of unpaid base salary based on the closing price of the Company's stock as of the final day of the fiscal year in which such salary was earned. In addition, Mr. Sheppard shall be entitled to a bonus in the amount of $150,000 to be payable in common stock of the Company, upon the acquisition of a subsidiary or business valued at greater than $1,000,000. Such acquisition bonuses will be issued based upon the closing price of the Company's stock as of the date of the closing of such an acquisition. Mr. Sheppard receives no separate compensation to serve as a director of the Company. In the event Mr. Sheppard employment is terminated for whatever reason, he will be entitled to salary and benefits that have accrued prior to the date of termination. There are no provisions for severance payments upon termination in the agreement. Mr. Sheppard is subject to a non-solicitation prohibition for two years after his termination of employment with the Company. During 2015, no employment contracts were entered into with any officers. We sponsor no plan, whether written or verbal, that would provide compensation or benefits of any type to an executive upon retirement, or any plan that would provide payment for retirement, resignation, or termination as a result of a change in control of our company or as a result of a change in the responsibilities of an executive following a change in control of our company. Our officers and directors do not have unexercised options, stock that has not vested, or equity awards. There were no outstanding equity awards to our named executive officers at September 30, 2015. The persons who served as members of our board of directors, including executive officers did not receive any compensation for services as a director for 2015. We do not currently have Board committees, including an audit committee. Our Amended and Restated Articles of Incorporation ("Articles") provide that our directors and officers be indemnified by us to the fullest extent authorized by the Nevada Revised Statutes, against all expenses and liabilities reasonably incurred in connection with services for us or on our behalf except for (i) acts or omissions that involve intentional misconduct, fraud or a knowing violation of law or (ii the payment of dividends in violation of Nevada law. Our Articles also permit us to secure insurance on behalf of any officer, director, employee or other agent for any liability arising out of his or her actions in this capacity. Our Articles provide that we will advance all expenses incurred to any person who was or is a party or is threatened to be made a party to any threatened, pending or completed action, suit or proceeding, whether civil or criminal, upon receipt of an undertaking by or on behalf of such person to repay said amounts should it be ultimately determined that the person was not entitled to be indemnified under our Articles or otherwise. Our Bylaws provide that our directors and officers be indemnified by us to the fullest extent authorized by the Nevada Revised Statutes, against all expenses and liabilities reasonably incurred in connection with services for us or on our behalf except that there shall be no indemnification if a person is adjudged liable to the Company unless and to the extent that despite such adjudication, the court determines that such person is entitled to indemnity or determined by the majority of directors, independent legal counsel or the stockholders. Insofar as indemnification for liabilities arising under the Securities Act may be permitted by directors, executive officers or persons controlling us, we have been informed that in the opinion of the SEC, such indemnification is against public policy as expressed in the Securities Act and is therefore unenforceable. The following table lists, as of January 10, 2016: (i) each person or entity known to us to be the beneficial owner of more than 5% of our outstanding common stock or preferred stock; (ii) each of our named executive officers and directors; and (iii) all executive officers and directors as a group. Information relating to beneficial ownership of the Company's stock by our principal stockholders and management is based upon information furnished by each person using "beneficial ownership" concepts under the rules of the Securities and Exchange Commission. Under these rules, a person is deemed to be a beneficial owner of a security if that person has or shares voting power, which includes the power to vote or direct the voting of the security, or investment power, which includes the power to vote or direct the voting of the security. The person is also deemed to be a beneficial owner of any security of which that person has a right to acquire beneficial ownership within 60 days. Under the Securities and Exchange Commission rules, more than one person may be deemed to be a beneficial owner of the same securities, and a person may be deemed to be a beneficial owner of securities as to which he or she may not have any pecuniary beneficial interest. Except as noted below, each person has sole voting and investment power. The percentages below are calculated based on 80,399,187 shares of common stock issued and outstanding as of January 10, 2016 and 3,000,000 shares of our Series A preferred stock issued and outstanding as of the same date. Richard N. Wilson, Chief Executive Officer of Five Arrows Limited ("Five Arrows") has sole voting and investment power over the shares held by Five Arrows. Richard N. Wilson, director of Cavenagh Capital Corporation ("Cavenagh"), has sole voting and investment power over the shares held by Cavenagh. Excludes (i) 3,298,503 shares held by More Superannuation Fund of which Mr. Sheppard is co-trustee and co-member and shares voting and investment power of the shares held by More; (ii) 64,000,000 shares held by Five Arrows of which Mr. Sheppard is the sole owner; and (iii) 3,000,000 shares of Series A Preferred Stock held by More which have voting rights equal to 20 shares of common stock for each share of preferred. When these shares are included by attribution, Mr. Sheppard's voting power exceeds 87.44%. Also excludes any shares of common stock to which Mr. Sheppard may earn pursuant to his employment agreement with the Company; should the Company have insufficient funds to pay Mr. Sheppard's salary, in an amount equal to three times the amount of unpaid base salary and shares in the amount of $150,000 upon the acquisition of a subsidiary or business valued at greater than $1,000,000 as a bonus. Represents 100% of the total issued and outstanding shares of Series A Preferred Stock which has voting rights equal to 20 shares of common stock. Series A preferred stockholders votes together with common share holders, not as a separate class. More Superannuation Fund controls 63,298,503 votes, 3,298,503 from common stock and 60,000,000 from its preferred stock which votes with common stock at 20:1. This provides More with 45.08% of the combined voting power of the Company. The Company does not have any change-in-control agreements with its executive officer nor know of any arrangements which may result in a change of control of the Company. Except as described below, there were no transactions with any executive officers, directors, 5% stockholders and their families and affiliates during the fiscal year ended September 30, 2015. Vincent Appo, the Company's mining manager is a director and a 10% shareholder of our Papua New Guinea subsidiary, Aqua Mining (PNG) Limited. On December 10, 2014, the Company authorized the issuance of 3,001,702 shares of common stock to Warren Sheppard pursuant to the employment contract between the Company and Mr. Sheppard. From time to time, the Warren Sheppard provided advances to the Company for its working capital purposes. These advances bear no interest and are due on demand. For the fiscal year ended September 30, 2015, these advances totaled $339,920. Moreover, from time to time, the Company issued Convertible Notes to Warren Sheppard as detailed in Note 6 to the Financial Statements. For the fiscal year ended September 30, 2015, the Company had issued a total of $366,318 in such Convertible Notes to Warren Sheppard. The related party loans consist of (1) a five-year loan agreement dated July 15, 2011 for $150,000 AUD loan from Hancore Pty Ltd. (Hancore Pty Ltd. is a related party via it's more than 10% ownership by Warren Sheppard), and (2) a $230,000 AUD loan dated September 30, 2014 from Warren Sheppard. The Hancore loan is unsecured and has a 20 percent per annum interest rate. The Sheppard note is unsecured and is interest free. On February 28, 2015 the Company sold to Hancore Pty Ltd., a related party, its interest in Instacash in exchange for cancellation of the $500,000 promissory note and accrued interest owed to Hancore Pty Ltd. from the acquisition of Instacash in October of 2013. We are not subject to the listing requirements of any national securities exchange or national securities association and, as a result, we are not at this time required to have our board comprised of a majority of "independent directors." We do not believe that our director currently meets the definition of "independent" as promulgated by the rules and regulations of the NYSE Alternext US (formerly known as the American Stock Exchange). The Board of Directors has not established an audit committee and does not have an audit committee financial expert. As a smaller reporting company, we do not have an audit committee. Warren Sheppard, our sole director, approves all accounting related activities prior to the performance of any services by any accountant or auditor. The percentage of hours expended on the principal accountants engagement to audit our consolidated financial statements for the most recent fiscal year that were attributed to work performed by persons other than the principal accountants full time, permanent employees, to the best of our knowledge, was 0%. ITEM 15. EXHIBITS AND CONSOLIDATED FINANCIAL STATEMENT SCHEDULES. In accordance with Section 13 or 15(d) of the Securities and Exchange Act, the registrant caused this report to be signed on its behalf by the undersigned, thereunto duly authorized, on this 13th day of January 2016. In accordance with the Exchange Act, this report has been signed below by the following persons on behalf of the registrant and in the capacities and on the dated indicated.